If there was one thing I knew that I would take away from this entire study abroad program, it was that I would have a hands on experience on history and culture here in Central Europe. This is to say the least; I have been quite surprised by how much more there really was to this experience. This program, thus far, has not only opened my eyes to the so called “lost history” that is not taught often back home; it has introduced me to a different perspective on the efforts that are being made toward reconciliation between countries in Central Europe’s borderlands. One of the main things that has greatly affected me in such a positive way was our stay at Krasnogruda thanks to the Borderlands Foundation. It dawned on me that this experience was going to be like none other from the first step I took on their cobblestone path. The wooden accented walls and furniture made the house seem very cozy yet in a way haunting. What made it haunting was that I felt that there was a story that was hidden in those walls and soon enough I came to realize that there was something bigger than I had ever imagined. 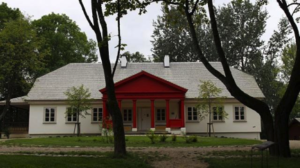 The Borderlands Foundation is an extraordinary organization that aims to build bridges between nations in order to bring them together and recognize and appreciate the history and culture that was so vibrant not too long ago in Poland. In this memorable experience with the Borderland Foundation we had the honor of meeting the president of the foundation, Krzysztof Czyżewski, who expressed his belief that a respect for multiple cultures and traditions as well as “interdependence” is what allowed this foundation to become so successful. They use an interactive as well as hands approach to encouraging involvement in the community in order to inform the younger generation as well as the older generation that ethnicity is not something that should separate us but is something that should actually bring us together. In an intriguing class discussion with our professors, Hana Cervinkova and Juliet Golden, we examined the idea of ethnos versus ethos and how the Borderland Foundation aims to bring out the ethos in order to bring together all ethnicities and backgrounds as well as to accept the history and do what can be done to gain knowledge about it instead of trying to consign to oblivion. We attended four different workshops, lead by artists/activists of the Borderlands Foundation, each portraying how they contribute to the “building of bridges” in the community. The first workshop showed how the organization uses art to allow children to express their creativity in an artistic way, creating ceramic objects as well as picture books. The content in these artistic creations are what brought the stories and objects to life. 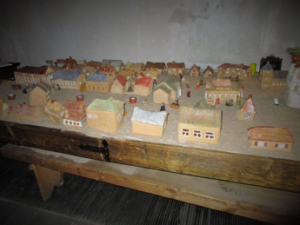 Children created these ceramic houses that told a story about a person that used to live in this small town and they were used in their theatrical performances. It allowed these children to immerse themselves in the rich and lively history of what used to be. The second workshop focused on nature and the exploration of the grounds of Krasnogruda. It was explained that the grounds were about 22.4 acres as well as trees that are over two hundred years old. The third workshop involved another artistic form of involvement. Children of different ages came here to work together in creating short videos about various topics. This workshop particularly opened my eyes the most. The director and speaker, Bożena Szroeder, explained how she and her team tried to engage these children in activities that bring children of all ethnicities together. She explained how the children, with the help of elders, created videos that involved Jews, rabbis, and people from other backgrounds as well. We were shown several films and it was very interesting to see how these children were exposed to all this history and diversity in such an interactive and creative way. She explained that they were often told to not touch the subject of history of the Jews that once lived there. Despite this, they were still able to successfully create magnificent shows. 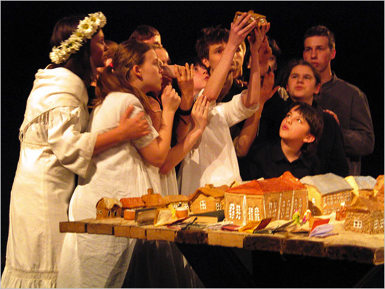 One amazing performance she directed was the Kroniki Sejneńskie (Sejny Chronicles). This performance showed the history of Sejny in the eyes of those who don’t live there anymore as well as celebrates the history of their town. In the fourth workshop, we took a look at some more artistic ways children were able to engage through music and crafts. We were shown a display of the city that was made by clay by these children. All of these different workshops really put into perspective how something that starts off small can make such a great impact on people. The Borderlands Foundation is a great example of fighting for something you believe in. I was completely inspired by the work that they do. 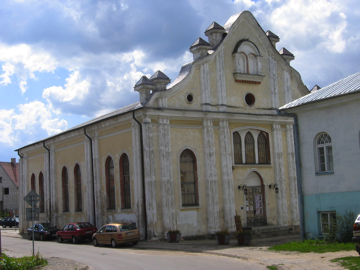 The history of Jews can be so easily brushed away especially in small towns like Sejny. This foundation is a great example of what this class aims to expand on, Reconciliation. It shows how we can build these bridges between different groups and individual in the borderlands in order to thrive and learn from one another. One of the things I remember Krzysztof Czyżewski saying is that it is not about one country versus another country’s border but about borders in a community instead. This is how this foundation has created such an impact on its community and many other communities as well, by creating bonds and feeding knowledge to those who are willing to hear it.